“Everything you will ever want is presently owned or controlled by someone else.” Think about it. 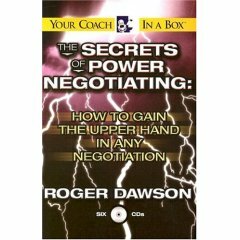 I just did a second pass through Roger Dawson’s audio series called The Secrets of Power Negotiating and took notes this time in mind map format and made them available for download. This series is an excellent overview of how to improve your negotiation skills. It begins by pointing out that no matter what your job is, you are negotiating for things every day. Roger teaches the twenty tactics, or “gambits” involved in effective negotiations and also how to adapt to the different personality styles and how the different types of power influence us. If techniques like The Fait Accompli and Flinching seem too shady and “used-car-salesman” for you to use yourself, you should at least be aware of their presence. Being familiar with the mechanics of negotiations means you can identify when these tactics are being employed against you and easily disarm them. I had many take-aways from this series, the first of which was that he copied my header for his cover design. I mean c’mon Roger, I’ve had the purple lightning bolt thing for years now… ;-) But seriously, it was helpful to learn the Bracketing technique, how to disarm a resort to higher authority and how the value of services diminishes rapidly once those services have been rendered and therefore why you should lock down the details up front. Also useful was the trade-off maneuver for getting instant, reciprocal goal concessions to bring negotiations to a close, the Nibbling strategy and the counter maneuvers for the good-guy/bad-guy technique. For $14, the series is worth the bonus disc alone in which he teaches you how to negotiate your next automobile purchase. For me I disliked the idea that I was at a disadvantage being unaware of these tactics that others could use to manipulate me. Hopefully posting this outline for public consumption is kosher (I’m surprised they don’t have a better synopsis in the Amazon review). In reality, the value of the notes by themselves is marginal since 90% of the effectiveness of using these techniques is in their delivery and you need to hear Roger’s voice to get it right. I highly recommend this series to anyone who needs to negotiate something – okay basically everybody with a pulse… You can download the mindmap below or view the HTML version if you don’t already have Freemind installed. And if you’re not mindmapping, here’s why you should be. I was looking for a negotiation mindmap and found some information about this.